Yup that's right! 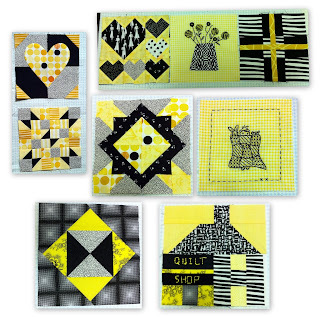 I've joined in on the Splendid Sampler Sew Along hosted by Pat Sloan and Jane Davidson. You may have noticed the sidebar link. Here are the ones I've completed so far. All those tiny pieces have been challenging (blocks are 6 inches finished), but what a way to use up small bits. As you can see, I'm sticking to a black, white and yellow colour palette. I've completed blocks 10, 11 and 12 but they are not pictured. Block 13 was just shown on Sunday and is in the construction stage. I'll end up having quite a collection when this sew along ends in March 2017. You can check out the Facebook page here to see what others are doing. Till the next time, may your creative ideas see fruition. Have fun with it! That is one rabbit hole I'm not going down!